Seagulls perform a gorgeous and colorful dance. The comic scene of the skylarks. A fantastic dance of waterbirds to the music of Hungarian Dance No.5 by Johannes Brahms. Penguins and Fairies of the Moon perform a comic continental tango. Butterflies dance to the show's theme song. In their kingdom the birds sing and dance beautifully and joyfully. Then in the evening all the birds fly home to their nests. The dance of the skylarks. The fairy tale of seagulls and and a mermaid. 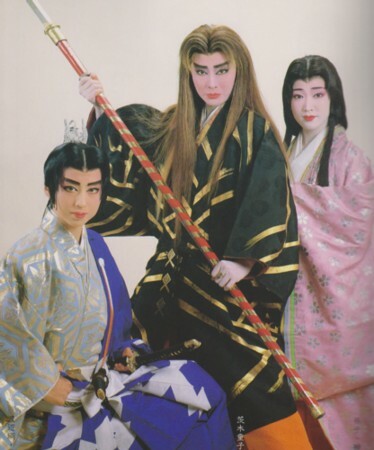 Kazuki Maho and Aoki Ryou retired after Takarazuka run, Akira Miyabi retired after Tokyo run. Oeyama Kaden was performed again in 1988 as a national tour. It has been revived in 2009 for Oozora Yuuhi and Nono Sumika's top debut performance. Created by lokai. Last Modification: Friday 17 of August, 2018 11:35:24 PDT by caithion.